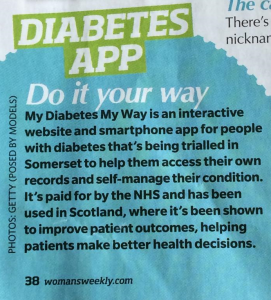 We were delighted when one of our senior software developer’s gran spotted a feature for our *MyDiabetes*MyWay mobile app in her Woman’s Weekly magazine! They highlighted that users in Somerset can access their medical records through our website and mobile app and how MDMW has been shown to improve patient outcomes in Scotland. We aren’t sure how we made it into Women’s Weekly but we’re very grateful to be featured in their widely read magazine!